I nearly had a heart attack when I came home from a chilly morning run the other day. And no, the run itself did not cause this almost cardiovascular disaster. I had been fantasizing about a piping hot bowl of banana, raisin, and cinnamon oatmeal for 5 miles. 5 whole miles of sweat and drool. It was intense. So when I burst through the front door I obviously headed straight for the kitchen. To my horror we were out of EVERYTHING except the oats. This savory oatmeal recipe is the direct result of not having my usual suspects on hand. And guess what…It was so stinking good that I have been eating this every day for the last three days in a row! I am addicted and you will be too. Before I get to the recipe I wanted to give a huge shout out to my sister. She came to town this weekend with my little nephew and we had the absolute best time together. She came to take a look at the farm and all of our progress. We even happened to sport matching vests. Sister farmers! 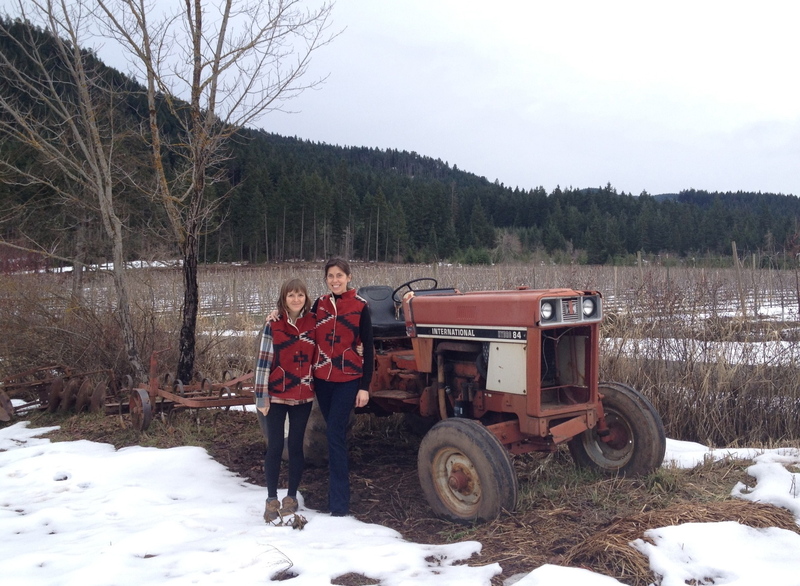 (Okay, she may not be a farmer, but what she doesn’t know is that I am recruiting her to weed like crazy this summer)! The garlic already needs it. Okay, back to the oatmeal that saved my life. This bowl of savory oats is delicious. I always think of oatmeal as being sweet. However, this recipe is a game changer for me. 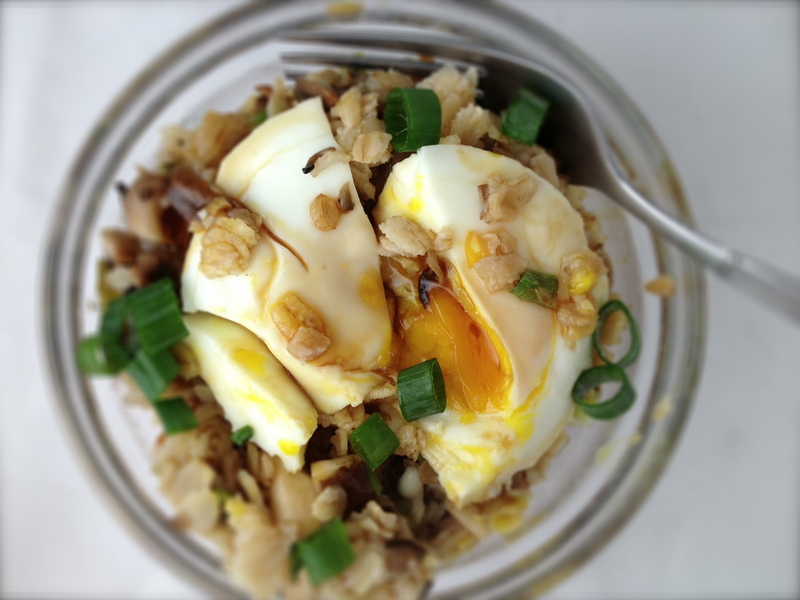 Between the earthy mushrooms, fragrant scallions, and runny egg yolk this meal was a home run. The addition of a little tamari sauce at the end tied the whole thing together. Heat a skillet over medium heat with coconut oil. Add scallions. Saute' for about 4 minutes. Add mushrooms and cook for about 4 more minutes. 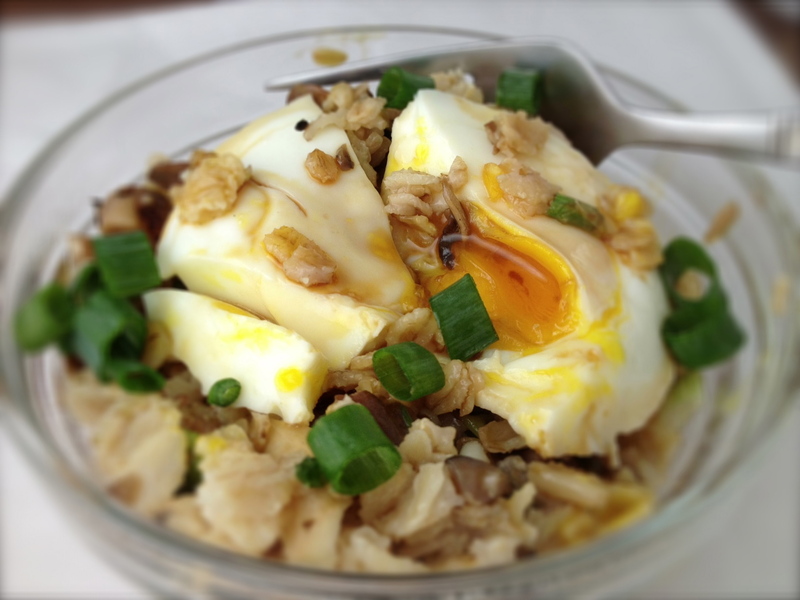 Once egg is poached, oats are cooked, and veggies are sautéed mix everything together. Drizzle a little tamari sauce and enjoy! As always use this recipe as a guide and adjust ingredients and measurements as needed. ooh, I’ve been wanting to try savory oats for a while- this might be the extra push I needed! It’s the worst when you come back from a run, having thought about what you’re going to eat the whole way, and then realize that you actually can’t have it. The. Worst. I’m so glad you improvised and came up with something so wonderful, though! This looks delicious, I’m definitely going to make it for our big weekend breakfast this weekend. I love oatmeal but I usually eat it plain with walnuts and some blueberries or something because I’m not big on sweet, but this is right up my alley. Yum! This looks like the perfect breakfast after a cold run. I always do sweet oatmeal, but savory oatmeal sounds so interesting! Will be trying for sure. Oh Andrea, you make me suffer right now (don’t worry, no heart attack ;)). That oatmeal must be freaking good but I’ll never have a chance to try it with a poached egg because of my allergy. At least I can look at those delicious pictures and feed my eyes :). 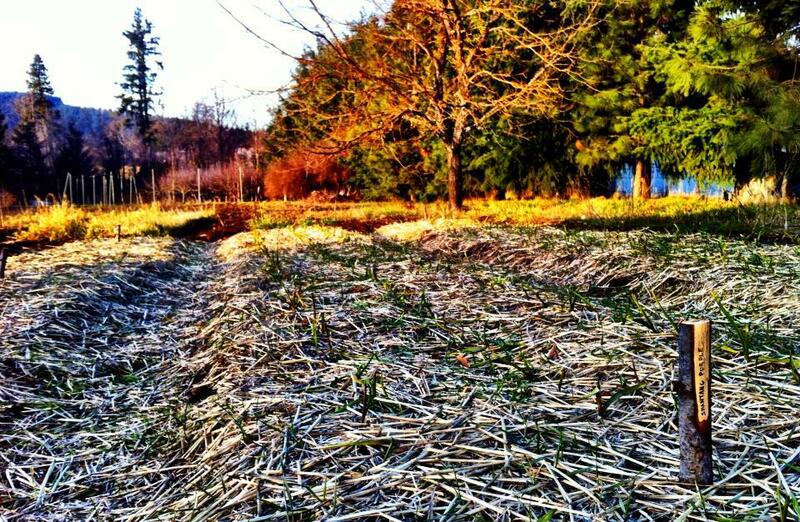 That shot of the garlic field is amazing! I’ve been wanting to try savory oatmeal for a while but haven’t gotten around to it yet – this version looks amazing! I’m usually too lazy or time-pressed in the morning to make oatmeal so a dinner version would be great for me! When I was a kid I remember having to explain to my friends at school that when you are a farm kid, “weeding” it wasn’t just pulling dandelions out of the window box for 20 minutes, it’s several weekends with a shovel and a wheelbarrow and pulling Russian Thistle out of a 25 acre pasture! And I think that savory oatmeal is complete brilliance. I’m normally a sweet oatmeal kinda gal, like adding in a handful of chocolate chips kinda sweet 😉 This however looks like it would satisfy me for an entire morning! Whoa. Game changer is correct! I never would’ve thought to turn my oats savory, and I LOVE this idea! I’ve been meaning to try savory oatmeal for a while. I love the idea of an egg on top and a bit of tamari. It looks wonderful. I’ve only had savory oats once and they were so good. I need to do it more often! Oh my gosh, I actually spent the morning trying to come up with savory oatmeal ideas because I’m bored with cinnamon & walnuts and prefer my breakfast a lil spicy. This looks delicious! Thanks for a great recipe, can’t wait to try. Wow, running 5 miles in the morning and farming? You’re my hero. I’ve never tried savory oatmeal. I bet this would be delicious with quinoa, too!